Decked with halo halo ingredients, this fluffy and delicious ensaimada is a steal! 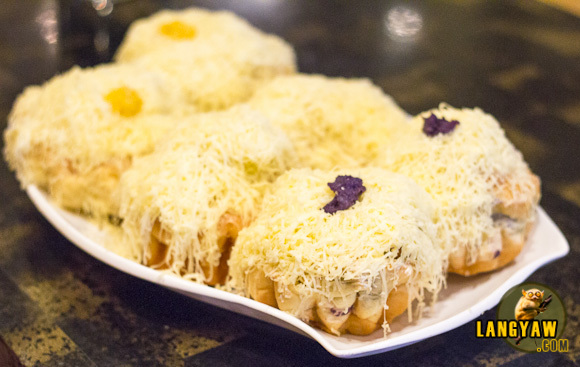 A dish of ensaimada of different flavors densely covered with cheddar cheese. CLICK TO ENLARGE. Its quite tempting, but with its size, its ought to be shared. The ensaimada of Marco Polo, which started at the buffet at Cafe Marco were smaller. But when they opened the cake counter at the Lobby Lounge in 2010, Chef Rodel Galvez revised the recipe and size and has been gaining in popularity ever since. Just imagine, during the festive month of December, the Marco Polo Plaza Hotel was able to sell 5,438 pieces! strips in syrup. Inside, there are also bits and pieces that gives texture. And it is a steal at just P88, a very good baked item that is great value for money! The ensaimada is available at the Lobby Lounge Cake Counter and can be bought singly, or in boxes of three, six and twelve.